Experience and a strong dedication to client interests can make the difference in personal injury, criminal defense, and family law matters. At Whiteaker & Wilson, we believe that obtaining justice means protecting the rights and interests of our clients above all else. As highly experienced Springfield, Missouri injury lawyers , we have obtained justice and fair compensation for thousands of clients. Having successfully defended many cases on behalf of insurance companies, our attorneys can effectively challenge insurance company defense lawyers. Not every case we handle needs to go to trial in order to obtain positive results for our client, and we often settle matters satisfactorily short of trial. But some cases require a firm, even aggressive approach to obtain the results our client desires. In those situations, you can expect us to pursue justice assertively and with passion. In every legal matter, our objective is to obtain the best possible results for our client. 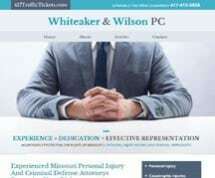 To arrange for a free initial consultation with a Springfield, Missouri injury lawyer at Whiteaker & Wilson, or regarding any other matter, call us at 417-882-7400 or contact us online . Electric Mutual Liability Insurance Co.